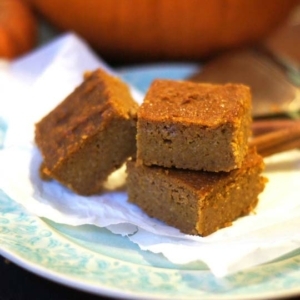 Moist bars that taste like pumpkin pie filling! Preheat the oven to 350F and grease a 9"x9" baking dish well with butter or coconut oil. Combine all of the ingredients in a large mixing bowl, and stir well until no clumps remain. Transfer the batter to the greased baking dish, and use a spatula to smooth the top. Bake at 350F for 40-45 minutes, or until the edges are golden and the center is firm. Allow to cool completely, then cut into squares and serve. Store in in the fridge for up to a week.